Exclusive and limited - just a few copies left...! Nicely packed with 8 pages full colored booklet, alternate cover inlay-card + sticker-set! 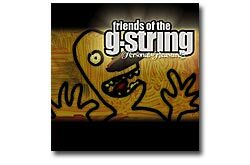 The "Friends of the G-String" project has become a band namend "Bent Not Broken" und the link above takes you to the BnB order form. And in case you want to find out, how the Friends of the G-Stringsound today, just visit the Bent Not Broken website!